Last week we delivered our first article for Across The Pond and they liked it so much they've asked us back again. So let's get Ready For The Weekend! 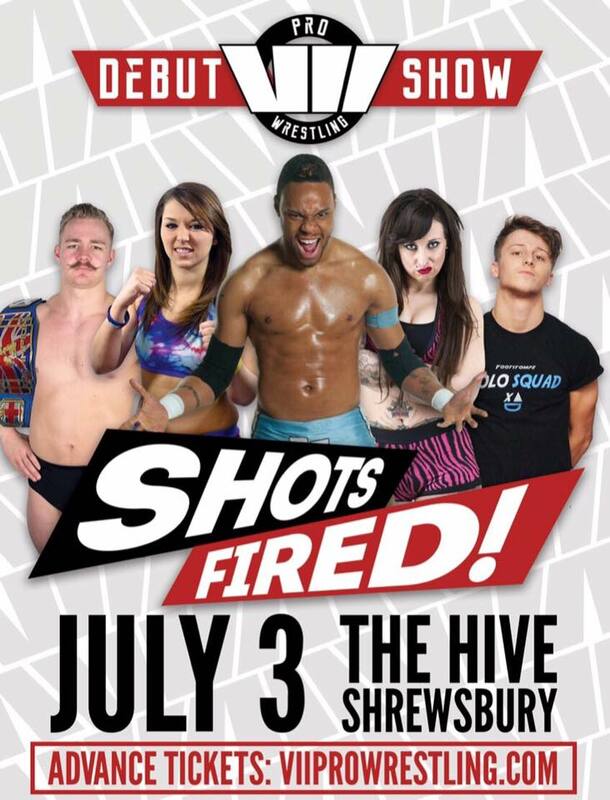 On Friday night, new promotion, VII Pro Wrestling host their debut event, Shots Fired, at The Hive in Shrewsbury. For a first outing, VII Pro certainly aren't holding back with the matches or the talent involved. One of the matches confirmed will see Damian Dunne facing Bubblegum. Now stand-out matches on shows will often feature one of these two men so combined it can't fail to be a recipe for success. VII Pro have already shown a strong working relationship with Shropshire Wrestling Alliance and that is further solidified with Tyler Bate scheduled to defend the SWA British Lions Championship against Chris Ridgeway this Friday. A third match announced for VII Pro's debut will feature one of British Wrestling's under-utilised gems in the shape of Mike Bird. Now Bird is a hell of a wrestler and has played a part in the training of some of the UK's best young talent such as Nixon Newell. The 'Ginger Jesus' will have a tough task ahead of him though as he faces Ryan Smile, a man himself who faces some of the best in Britain on a weekly basis. Other names confirmed for the show are Violet Vendetta, Nixon Newell, Chris Brookes and Drew Parker to name a few. 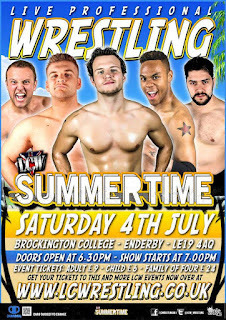 Saturday sees Leicester Championship Wrestling back at their home venue of the Brockington College in Leicester for Summertime. 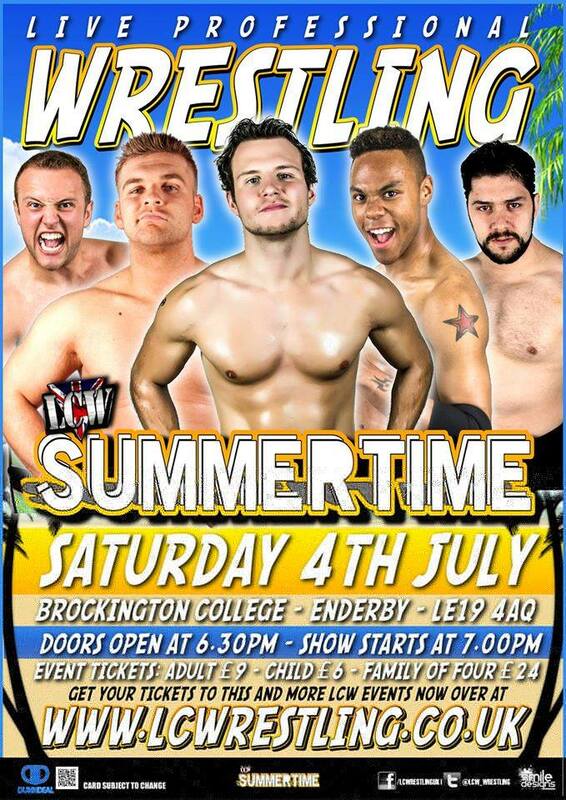 Very few shows can boast a guaranteed new champion but LCW can this Saturday a they shall be holding a four-way match between Chris Tyler, HC Dyer, Ryan Smile & TK Hayward to crown the inaugural LCW Young Guns champion. Speaking of champions, Joseph Conners will be defending the LCW Heavyweight Championship against bitter enemy, Alex Gracie on the 4th of July. And if you like your wrestling of the heavyweight variety then you'll not go far wrong when 'The Heavyweight House Of Pain' Stixx takes on Barricade.The show also features The Hunter Brothers defend their tag team titles against Cooper Nation 2.0, plus matches involving Xander Cooper, Jimmy Meadows, Paul Malen and a lot more UK talent. On the subject of talent, a place you'll always see so much talent that you could shake a tree at it, never mind a stick, is New Generation Wrestling. 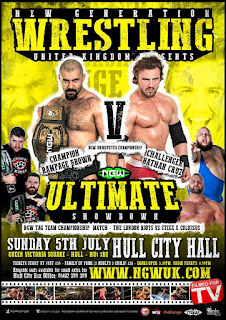 On Sunday, NGW are back at the Hull City Hall with Ultimate Showdown. Now as you'll have seen, we focus on about 3 matches from each one of the shows we highlight. This show has so many amazing matches on it, we've literally spent an hour trying to just pick three! Sitting right at the top of the card is the NGW Championship match between current champion, Rampage Brown and the challenger, Nathan Cruz. We could say thee two men don't like each other, it wouldn't do it justice. They hate each other, to the point that Rampage Brown has told Cruz he ha signed his own death warrant by asking for it. Then to continue the theme of bad blood, we have The London Riots defending the NGW Tag Team Championship against Stixx & Colossus Kennedy. The Riots defeated Britain's Biggest Tag Team for the belts, breaking Kennedy's leg en route to the win so proved they'll go to any length to win. However, Stixx & Colossus have also demonstrated in the past few months that they'll do whatever it takes to get revenge and the championship back. This is the point where we really became to struggle on choosing a third match from the five remaining. So in the end we decided that none of the five needed us to 'build them up' (not that any of the others did either!) as they were great matches themselves. So we'll simply tell you them. Dara Diablo is facing Matt Myers, Mark Haskins competes against Justin Sysum. Bubblegum, El Ligero & Wild Boar are facing off in a triple threat match, Joseph Conners is facing Morgan Webster and last but certainly not least, Dan James & Liam Slater are facing The Proven's Caz Crash & Sam Wilder in a tag team match. Now you see the problems we had!